MSNBC contributor Toure' took to Twitter to apologize for his heated appearance on CNN's Piers Morgan Show in wake of the Trayvon Martin shooting. "I should not have gotten caught up in 'winning' the debate with Piers," Touré wrote on Twitter. "I got caught up with 'winning' on some masculine bravado bs when my whole point has always been justice for this boy. I lost sight of that." Indeed he did lose sight of the big picture, but at least he's adult enough to admit it. Emotions are high on all sides, but we must continue to remain level headed and ensure that justice is obtained for Trayvon. The BIG PICTURE is Justice for Trayvon and anything short of that is worthless. 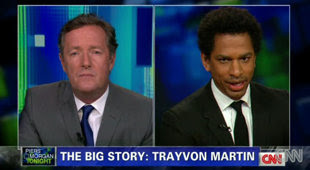 Click here to watch Toure'/Piers Morgan showdown.